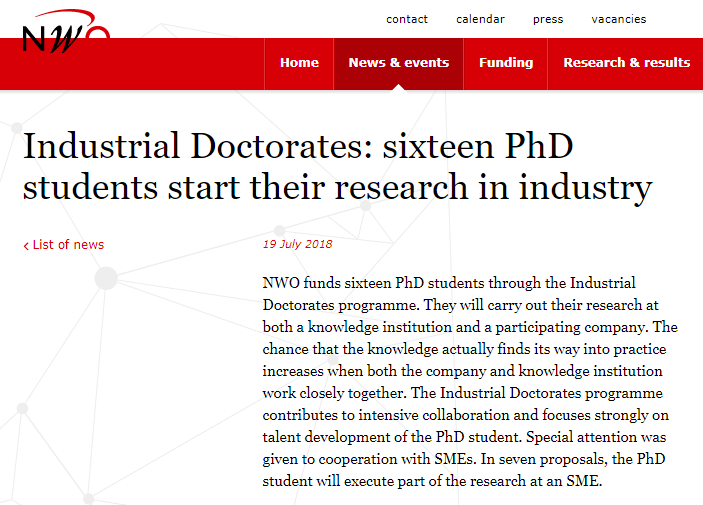 Last August 2018, the Netherlands Organization for Scientific Research (NWO) awarded an Industrial Doctorate grant to a collaborative project between Sulfateq B.V. and the group of Prof. dr. Henning from the University Medical Center Groningen (UMCG). The exhibition enables Sulfateq and the UMCG to unravel the precise effects of a new class of medicines and to test their application in different clinical pictures. The grant subsidizes an employee of Sulfateq for a period of 4 years and enables them to carry out doctoral research within both the company and the knowledge institution. With the acquired scholarship Sulfateq and the UMCG want to bring a new medicine against acute kidney damage from the pre-clinical to the clinical phase. The awarded Industrial Doctorate is the only award in Groningen, and thus constitutes an appreciation for the good relationship between Sulfateq and Henning’s group for many years. The subsidy is aimed at promoting collaboration between knowledge institutions and small and medium-sized enterprises (SMEs) in order to increase the implementation of knowledge. Bringing together the practical attitude of people working in SMEs with the scientific knowledge within the University leads to practically applicable products that are secured by thorough knowledge. The program selects the right people from the business community who are capable of doing so, in order to increase scientific knowledge and make a promotion for the person concerned possible. The collaboration between Sulfateq and UMCG has led to the development of a new class of promising drugs. The development of this is a versatile and knowledge-intensive journey that knows many aspects. Sulfateq provides indispensable knowledge, including the production of the medicine, and data on the safety of its application in animals and humans, the so-called toxicity study. Drug development is risky. When a medicine does not meet a part, the entire process often has to be restarted. The chance of success is therefore low. It is therefore special that the partnership has succeeded in making such a journey, from a thought to usable products that are now being tested. Sulfateq and Henning’s research group have had intensive cooperation since 2011. Henning is fascinated by hibernation and in particular the mechanisms that protect hibernators from damage. During hibernation, animals become very cold (about 4 ° C), but they warm up every 1-2 weeks. Henning discovered a mechanism that protects the hibernators from this rapid temperature change. In collaboration with Sulfateq, substances were developed that activate this mechanism, and these also appear to work in human cells. With this, Sulfateq has a potential drug that people can protect in bad times, e.g. in diseases such as diabetes and COPD or in difficult situations such as a long-term operation or major accident. A portfolio of substances has now been developed that can be further developed as a medicine. First, the most active substance is developed to prevent acute kidney damage during cardiac surgery. Currently there is no therapy or medication available for protection against acute kidney damage during major operations. By means of the SUL-138 substance it is possible to temporarily bring people into a kind of hibernation during an acute condition such as sepsis (blood poisoning) or an operation. The body is then, as with animals in hibernation, in a rest position so that the metabolism is slower. This may possibly prevent the damage to organs.